What an absolutely perfect Oklahoma summer weekend...in March! After seeing a forecast of great weather for this weekend, Dianne, Dylan and I threw together a spur-of-the-moment road trip to K-River Campground near Antlers, OK. You can visit their website at www.KRiver.com to learn more about the Kiamichi River campground we stayed at. K-River offers camping for both tents and RV's, but we decided to go all the way and rent one of their fishing cabins. The cabins are not exactly luxurious, but their location can't be beat. Our private quarters on the riverside allowed us to get out on the water early and play until late. I'm sunburned and sore but so very satisfied. We expected to only be able to do a little paddling around the campground this weekend, as there was no detectable current in the river, so no float trips. This proved to be more fun than we thought, as there are several nice creeks to paddle around the K-River camp. On Saturday, we paddled around the gravel bars just outside of our cabin and then down the river to where Buck Creek enters the Kiamichi. Buck Creek has several small rapids to cross, but the water was so low that we had to portage (a thrilling paddling term for walking) them going upstream so we could paddle down them afterwards. This provided some mild, safe fun, but I have no pictures to show you from that day. If I am planning to paddle a spot twice, I usually leave the digital camera behind on Day One. I do this is because it gives me time to make sure my camera will be safe and I can think about what kinds of pictures I will want to take. Also, it has been my experience that I see the best sights when I am camera-less. Besides we were planning on paddling the same spot again on Sunday. However, by Sunday morning things had changed drastically. Two nights of rain and a Friday afternoon water release from an upstream dam brought at least a foot or three of new water down the river. Every gravel bar we walked on Saturday was deep under some pretty swift current and suddenly our plans of paddling around the camp were canceled in favor of our first actual FLOAT trip with current in our new kayaks. Now, the boys at K-River campground make a little change renting cabins and such, but the main event for them is shuttling folks on float trips and renting them canoes and kayaks. 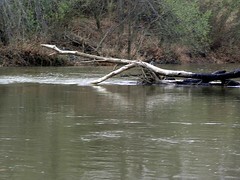 When we saw the high water on Sunday, we asked about float trips and they had several to offer. We would have loved to take the same trip we took last summer from the Pine Creek Put-in down to K-River Camp. Last year it was a fairly scenic paddle trip with some easy, fun rapids and one cool waterfall. However, there was very low water flow on that trip last summer. As they say, you never step into the same river twice! Since our plan was to check out by noon on Sunday, we opted for a shorter float trip. We paddled the yaks downstream from camp to the Ten Mile Creek take-Out point. This gaves us a short float trip with hardly any need to paddle at all. 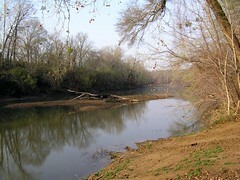 Ten Mile Creek is very cool looking and when we have more time and water we hope to paddle it again. It was a fun trip, but the day was so cloudy and gray that there was no good light for taking pictures. However, we did take a few before and after shots of the river that show how much it rose overnight. As usual, you can see more of our trip pictures on Flickr. If you are hoping to catch some high water on the Kiamichi River near K-River Campground keep an eye on the river gauge. Look for any CFS level above 50 CFS for good floating...this Sunday it was 719! You're making me want to go! When I saw the warnings over the week-end about the thunderstorms I thought of you guys; and said a prayer that there wouldn't be a tornado. Thanks for your support, TJ! I only wish Oklahoma had gotten more rain from the storms last weekend. Oh well, there is more rain still in the forecast. I think we are going to stay a little closer to home this weekend and pursue my wife's newest obsession....her quest for the perfect Onion Burger. It was a quest I was happy to provide backup for. I wish I had gone with you last weekend...it sounds like you had a blast !!!!! I wish I had gone with you last weekend...it sounds like you guys had a blast !!!!! We did have a blast, Bill! We haven't seen current in an Oklahoma river in many months. As a result we have been paddling our kayaks upstream or on flat water the whole time we have owned them. I think we are going to head up to Broken Bow and check things out on the LMF just as soon as the weather warms up again.